What most folk think of as a "suit of armor" is often 16th century jousting armor. That said, when someone with money went to an armorer to get a set of armor there were usually parts that could be added or removed. For example, the helmet that would actually be worn in combat had a fairly open face because limited vision in a battle is not a good thing and for better ventilation. For jousting, a visor with much more limited vision and heavier plates would be added. A small vision slit works if all you have to see is your oncoming opponent. the same is true of the rest of the armor, various plates would be added for the joust. The same set of armor configured for the joust could be much heavier than it would be for actual military service. Because it was thought very cool to have pieces of armor fly off at impact some pieces of armor were spring loaded so that if the opponent hit the target just right pieces would fly high into the air. I have seen a person wearing a full set of historically correct plate armor turn a cartwheel. Hardly so limiting to need a crane to mount a horse. I don't like Hollywood movies about Vikings: too much seax and violence. I have seen a person wearing a full set of historically correct plate armor turn a cartwheel. There is a story of William the Marshall (13th century) dancing with the ladies in full armor while waiting for a tournament to start. He may have said, "You'll have to pardon my dancing, I'm a bit rusty." Stated that William the Marshall danced in full armor. Perhaps in my next carnation. That's interesting -- what was he wearing? Now everyone at work is looking at me! And of course the Ladies in Armour brings up Elanor of Aquitaine when she accompanied Louis on crusade as well as Joan of Arc. Just to drop in on the bent sword, I believe from what ive read and understand was that the Vikings felt that a sword was a weapon that had its "magical" powers and often named them and respected them. And it was felt that a sword taken from a warrior killed would mean that it would bring bad luck and that the original owner of the sword would be waiting in the afterlife for vengeance. To prevent this the swords were bent and buried with the owner, enemy or not. I understand the religious beliefs of these people was very complex and there wasn't just an afterlife etc, and I'm sure I could have worded it better, but in essence I think it was done out of fear of the consequences in the afterlife. Also, there was a belief across many cultures that an item in grave goods had to be "killed" so that it could be used by the deceased on the other side. A spirit could not use a tangible object and a living person could not use an item that had been "killed" and rendered unusable. Evidence of this is often seen in pottery items that have a hole punched in them and in bent weapons. I suspect that this is a more probable explanation than postmortem security or fear of retribution in the afterlife. Gee, THANK YOU FOR THAT Thomas! Just what I need more addictive reading material. Heck, maybe I'll be able to keep up with a friend of mine with the masters in history. I'd be REALLY surprised if I pick up something he doesn't already know about but . . .
Also rendering a valuable item useless is a form of sacrifice practiced across many cultures. 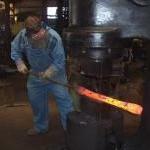 It's also a common practice for beginner blacksmiths. Don't we all, stop by I'll show you some of my trophies.